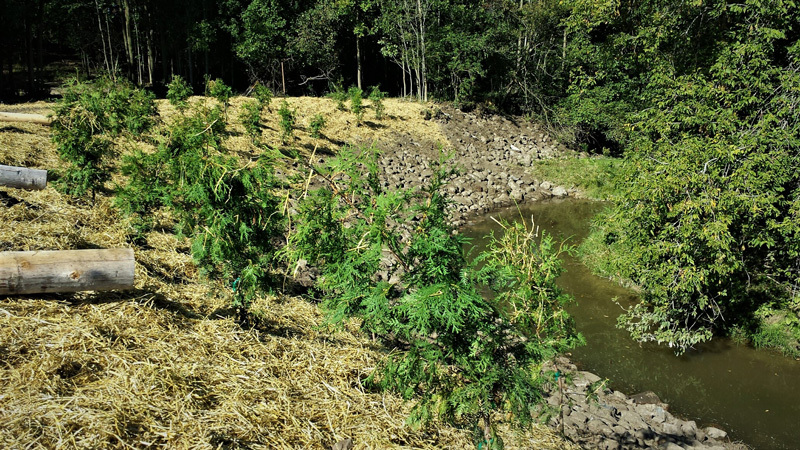 In instances where severe erosion has already occurred along a stream or riverbank, sometimes repair efforts beyond riparian planting are necessary. This tends to occur when factors negatively impacting bank stability have been a problem for an extended period of time. For instance, with the loss of vegetation in the riparian zone, flowing water (particularly during high flow events) will scour away large chunks of riverbank each year, exposing more and more fragile soil to erosion. Over the course of time, a severely eroded watercourse may stabilize in a new shape, but not before a significant amount of soil and useable land is lost to the erosive process. In order to prevent such cases of extreme erosion, bank stabilization can be achieved by re-sloping the current bank and reinforcing the base of the slope with large boulders and fieldstone. Typically, landscaping cloth is applied beneath the rock layer to hold back the underlying earth, and vegetation is planted on the new slope to further support the bank via the establishment of a healthy root foundation. 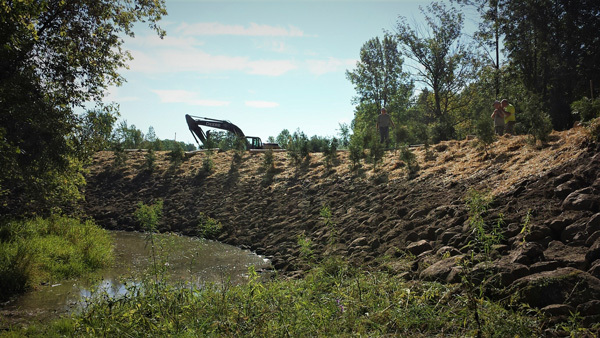 Depending on the severity of erosion occurring, and the height and steepness of the riverbanks, bank stabilization process can range from large projects requiring heavy machinery, to smaller projects that can be accomplished by hand. If you are having trouble with a highly eroded section of river on your land, call in or stop by the office and we can consider possible solutions to your problem.